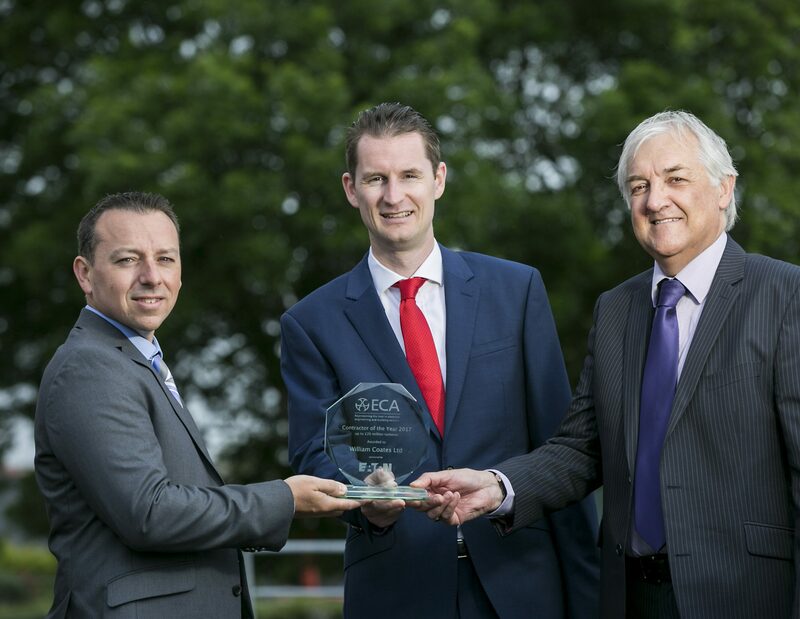 Mallusk based electrical and mechanical engineering company William Coates was one of eight top performing businesses, from across England, Wales and Northern Ireland, that scooped an award at the ECA Annual Awards in London. The company picked up the award during a gala evening event held on 9th June. The award was presented by TV personality and comedian Hugh Dennis, to Williams Coates for ‘Contractor of the Year – up to £20m turnover’ (sponsored by Eaton). The prestigious awards are recognition of excellence among ECA members within the engineering and electrotechnical services industry. Winners were chosen by an independent panel of judges, who looked for companies who demonstrated that they delivered the highest standards and were industry leaders throughout 2016. William Coates’ winning entry showcased its achievements, excellence, innovation and quality through its successful contribution on a high profile project – the national football stadium at Windsor Park. This featured building key partnerships, relevant training and an apprenticeship scheme. Paul Dickson, managing director of William Coates, comments: “Winning this ECA award is a huge achievement for everyone at William Coates. It demonstrates our commitment to providing excellent, innovative and high quality work which provided tangible results for our clients. It also shines a spotlight on the expertise of our fantastic team who are committed to driving the business forward. We are especially delighted that our entry showcased our work on the national football stadium at Windsor Park.